Top: “Animas Sunset” by Judy Morgan won both the Chamber of Commerce and DATO awards selected by juror Mary Ellen Long at the Four Corner’s Commission exhibition at Durango Arts Center. Middle: “The 29th Hour,” by Tirzah Camacho, won Best of Show. Hanging next to her painting is “Downward Spiral” by Jeff Madeen, a sculpture made of Juniper bark and ski-edge adhesive. Bottom: “Canopy” by Patrice Brown was awarded an Honorable Mention. 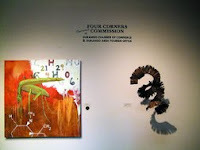 The juror for this year’s popular Four Corner’s Commission show at Durango Arts Center is Mary Ellen Long. Long has been a member of the Durango arts community for some time and is an established book artist. The arts center just named her their 2008 Sweetheart of the Arts honoree. This is the 12th year that the arts center has launched this regional juried exhibit designed to celebrate the uniqueness of life, the land and the diverse heritage of the Four Corners. And since the arts center is unwilling to pay for hiring an outside juror, Long is a logical choice: established, experienced, dedicated. This is Durango, I thought as I entered the Barbara Conrad gallery. The show features lovely landscape paintings, western-style photography, wildlife sculpture and a handmade wooden rocking chair, combined with contemporary painting and found object creations. It’s an attractive exhibit featuring artists from around the region. Most of the work is well executed and easy to live with. It’s the kind of art that makes one feel good. Best of Show went to Tirzah Camacho for her acrylic on canvas called “The 29th Hour.” The beautiful painting features warm browns, reds and yellows layered and dripping; a chemistry symbol sits in the lower right, its random numbers and letters blown up into a dripping white splotch. Atop the abstract background is a large, green grasshopper, symbol of motherhood, fertility and abundance. The painting deserves the $500 cash award. But I’m not in agreement with Long about her Juror’s Choice selection. Linda MacCannell’s “Defensible Space” is a photograph of a house mounted within a photograph of trees, surround by a gilded gold frame. It is an interesting concept, but a puzzling choice as other work in the show spoke to me in a way this work didn’t. Thaddine Swift Eagle won the Merit Award for “Voices,” one of her vibrant, surrealistic paintings with long text passages that tell a personal story. Both Camacho and Swift Eagle mine their own lives and spill their truths onto canvas in a way that is at once truthful and discomforting. It is exactly what art should do. 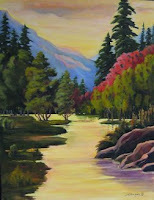 The Chamber of Commerce “Reflections of Durango” award, another $500 prize, went to Judy de Vincentis Morgan for her oil painting “The Animas Sunset.” The idyllic painting of the river under an early autumn sunset will be distributed in print form to all Chamber of Commerce members. The Durango Area Tourism Office selected Rebecca Koeppen’s soft pastel “Blowing Snow,” Ken MacAdams’ digital photograph “Red Mountain Splendor” and Morgan’s “The Animas Sunset” for their twelve-month online promotion award. An Honorable Mention went to Patrice Brown for “Canopy,” though I think “August Chamisa” was by far the best painting by this artist. Accomplished work that wasn’t recognized by the awards and promotion system of the exhibit include: Miki Harder’s “Scary, Scary Raven or Liam’s Guardian Angel,” Jan Mercer’s “Hesperus Hay Barn,” Jeff Madeen’s “Downward Spiral,” (which is the first art I’ve seen created with ski-edge adhesive), Jenny Treanor’s “Pagoda” and Al Olson’s “Twilight,” an elegant chromogenic print of lilies that looks delicately hand painted. With nearly 100 entries, Long had her work cut out for her selecting the 45 works of art on display. It may not be the most unique work we have in the region, but it does reflect life in the Four Corners – beautiful, pleasant, and a bit colorful and challenging. Four Corners Commission, 10 a.m.-5 p.m., Tues.-Sat., through Feb. 2, Durango Arts Center, 802 East Second Ave., 259-2606.
artsjournalist@centurytel.netLeanne Goebel is a member of the International Association of Art Critics.